The MOCKE Downwind Camps are the perfect opportunity for you to follow your downwind passion, further your downwind skills and take a downwind paddling trip, to an amazing international locale. You will be accompanied and tutored by the Mocke brothers, both passionate paddlers and both two of the world’s best downwinders. Set at the base of the most majestic cape in the world, the Cape of Good Hope, is the World’s best downwind paddle. 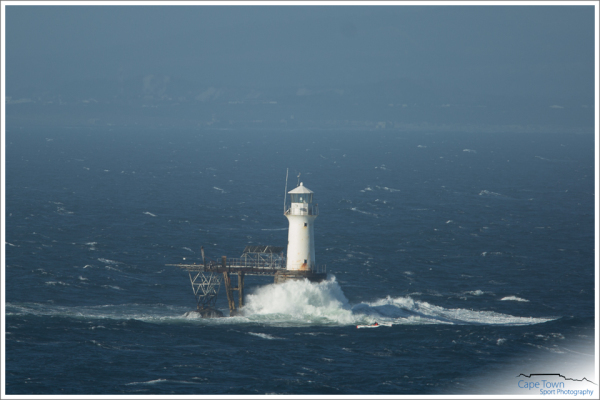 The Miller’s Run is a 12km stretch of ocean buffeted by perfect winds to create perfect downwind conditions. If you are hooked on downwind paddling, it’s paradise! The Miller’s Run is the training ground for the Mocke brothers, Dawid and Jasper. Everything that these two world champion paddlers have learnt (and perfected) about downwind paddling has happened on this stretch of water. With their combined knowledge and experience you cannot ask for two better mentors, teachers and coaches. Arrival day is on Friday. Nine (9) nights accommodation starting Friday night, last night is the following Saturday night. First paddling day is Saturday after arrival. First official downwind is Sunday. Starting at Miller’s Point, a few kilometers beyond the historical town of Simonstown, the coast runs perfectly parallel to the wind until it hits land in the beautiful Fish Hoek bay. It’s an easy launch with a safe finish in the sheltered Fish Hoek waters. No sweaty palms, dry palates or crooked necks worrying about surf. The constant variation of wind and swell size caters for a broad spectrum of paddlers. From beginner to experienced, the Millers Run is attainable and allows you to be as extreme as you want to be. From “death defying” to “fantastic fun”, the Miller’s Run delivers epic downwind paddling conditions. The distance is perfect. Long enough for a great outing in amazing conditions; short enough for anyone to make it. Typically it can be done in an hour or less, with a round trip from start to finish taking only an hour and a half. Doing multiple downwind runs in one day is the norm. Everything about this runs seems scripted: the conditions, the distance, the launch, the finish – all of it is just perfect. Now, to complete the script, the Millers Run needs you! Our 2019/2020 Downwind Camp Dates are confirmed. It is an absolutely amazing time of downwind paddling here in Fish Hoek, Cape Town during this period! There are 3 Camps to choose from, each lasting from Saturday to Saturday. Our first camps day is dedicated towards basic orientation, boat allocation and set-up and is a “no pressure” paddling day. This day we aim to get you comfy and ready to paddle in earnest. After orientation day, each day begins and ends with paddling downwind. If that’s not enough for you, we will do more! 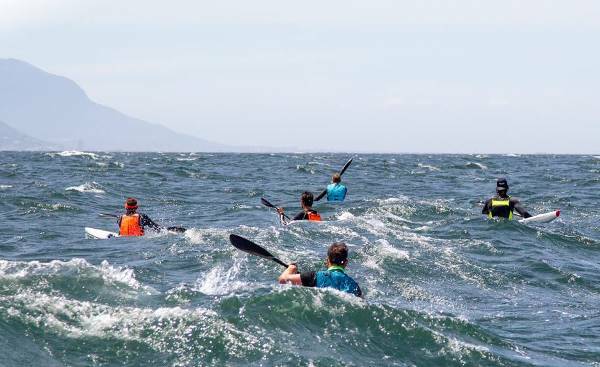 This is your time where you get to do as much downwind paddling as you can handle, on the world’s best downwind route, with the world’s best paddlers. 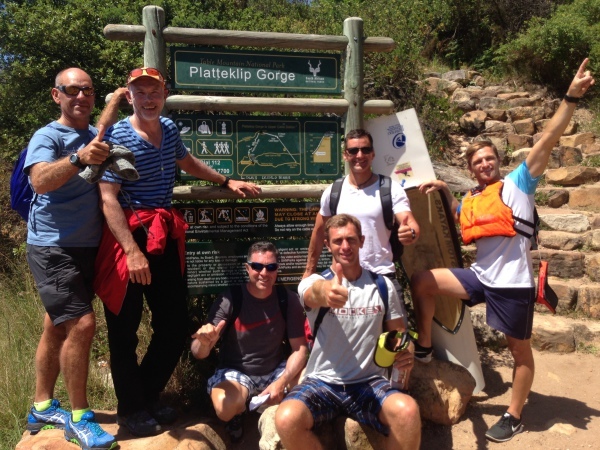 You will receive specific training and instruction from Dawid and Jasper Mocke. They will daily share with you their wealth of knowledge, session by session, and structured, so you can learn everything. From the basic pillars of downwind paddling to finding the runs; from specific skill enhancing downwind drills to advanced racing tips; from stroke correction to paddle choice, length and angle; from boat choice to the perfect boat set-up; and from nutrition to the paddler’s ‘mind’ – under their keen eye you will flourish in your downwind and general paddling ability. After each morning’s adrenaline fuelled start you can explore greater Cape Town with its world famous landmarks and attractions. Expect to visit stunning natural areas, engaging cultural and historic places, and experience the rich South African heritage. From a penguin colony, to the Cape of Good Hope; from the District 6 Museum to bohemian Kalk Bay; from Groot Constantia to Table Mountain – you will certainly experience Cape Town. Here is a Brief Example of what a typical week’s activities may look like. You’ve arrived at the start of the windy season. 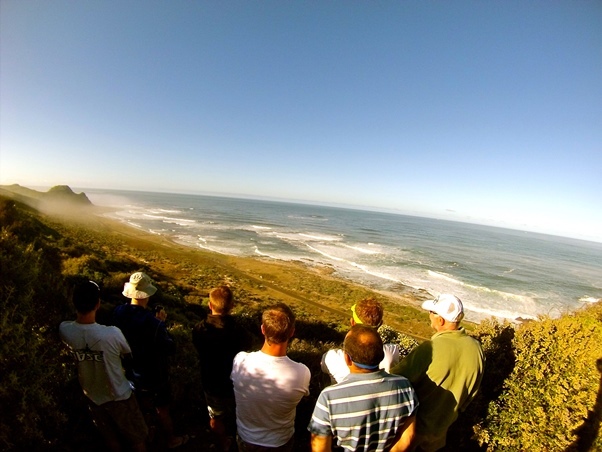 After settling in to your accommodation you are allocated your Surfski and assisted in creating the perfect setup. 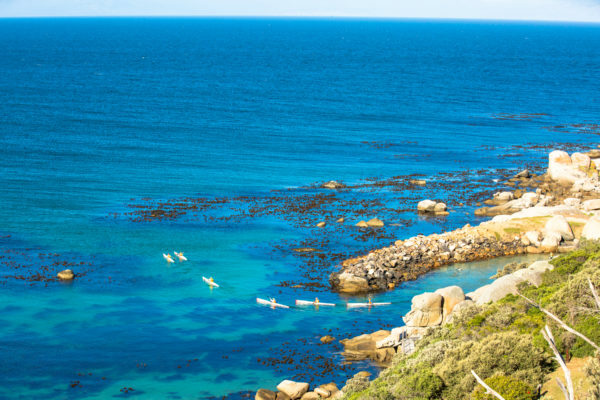 You’ll do a paddle out and back from Fish Hoek bay, allowing you to get your bearings. The evening is ushered in with some social sundowners. We finalise boat allocations and set-up for paddlers that arrived on Friday evening. We do a group briefing and basica orientation of the “lay of the land”. We work through the 5 key surfski skills and talk about “Catching a Wave”. Afterwards we go paddling in Fish Hoek bay together. Later in the day we paddle again before having a traditional South African braai. Todays’ Downwind Runs will start at 7am and 4pm respectively. Dawid and Jasper explain the Millers Run route in detail and share the 3 pillars of downwind paddling before you set off together. If you aren’t taking an midday break, we recommend a tour to visit the famous african penguin colony at Boulders Beach with breathtaking views across False Bay. 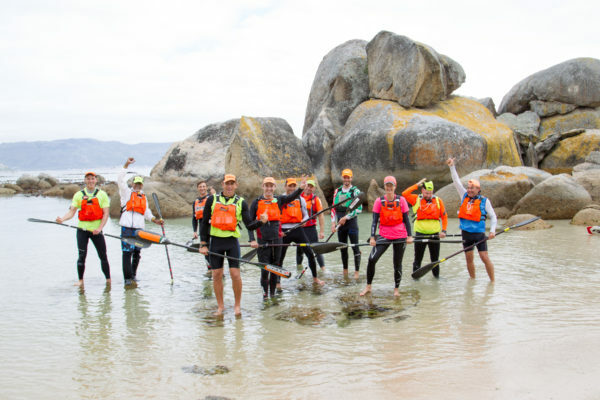 Spend some time strolling along the historical Simonstown High Street with its treasure trove of history and antiquities before heading back to paddle the Millers run once more. Today’s downwinds are about “finding the runs”. Dawid and Jasper show you what to look for and how to get there. You have the option of paddling in the back of a double ski to fast-track some downwind skill. The Cape of Good Hope – After breakfast we recommend that you tour to the most spectacular of seafaring sights – the Cape of Good Hope, the most majestic of all. You visit the Cape Point, see baboons, antelope and zebra and learn about the many shipwrecks along the coast, before heading back for the afternoon downwind paddle. The “Downwind Drills” that the Mocke’s have used for years to perfect their downwind ability, is today’s focus. During the afternoon downwind we will continue working on these important exercises. Today’s tour recommendation of choice is to South Africa’s oldest wine estate, Groot Constantia. It’s a spectacular wine farm with a rich history, amazing wines and fine cuisine. It’s time to start putting the skills together. The morning is reserved as a rest morning and we take you to one of our favorite places on earth – Table Mountain. It’s the quintessential icon of Cape Town and South Africa. No trip is complete without a Table Mountain selfie! Admiring the view from the top, you can see Robben Island, and perhaps all the way back to Fish Hoek. Records Day! This will be the day to get your best Millers Run time to be forever recorded in the annals of history. Putting your new learned skills to use, you will be amazed at how you are flying downwind! Jasper and Dawid are right there next to you shouting encouragement. Our tour recommendation for this day is Kalk Bay. The bohemian village of Kalk Bay is where we will visit today. The plethora of art-deco and trendsetting stores can keep you busy for hours. Enjoy award winning coffee and world class seafood, while taking in the Kalk Bay working fish harbour sights. Downwind Racing: there is a significant difference between a normal downwind paddle and a downwind race. 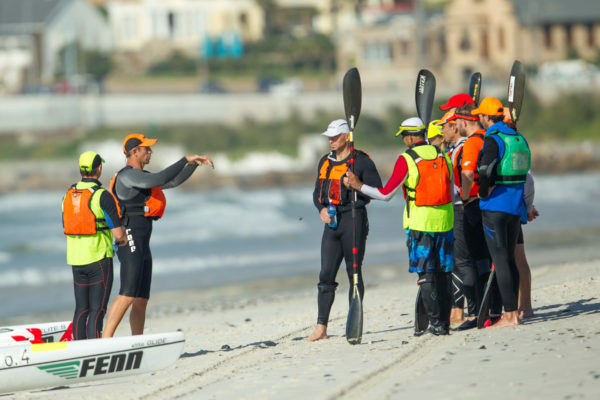 Today we assign a handicapped start to each paddler and race for line honours on Fish Hoek beach. Who will be king or queen of the group? Close racing the order of the day. We finish off the week by competing in the famous (or infamous) Seadog paddle race, which is famously, “Never Cancelled” no matter the conditions. A social evening follows where we can recount the weeks events. Depending on individual travel arrangements we will set off for a final Hurrah as you bid adieu to the World’s Best Downwind Run! 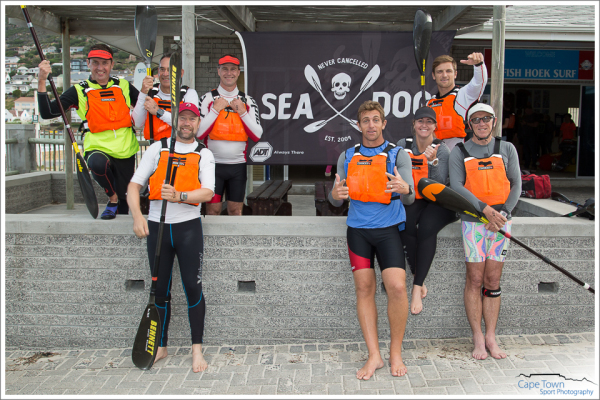 The MOCKE PADDLING Downwind Camps promises to take the world of downwind surfski education to a entirely new level. Arrival day is on a Friday. Nine (9) nights accommodation starting Friday night, last night is the following Saturday. First paddling day is Saturday. First official downwind is Sunday. It will be possible to extend your stay should you like to include an overnight (or 2 night) safari, or perhaps you would like to stay and paddle some more. Additional days and paddling plans will be individually coordinated. Daily coaching/instruction as per the camps is subject to availability. Cost for International Paddlers paying in USD ($) or equivalent. Day tours: Are pre-arranged but cost is not included as they are optional. Self Catering Option: Price is $1550. Self Catering Excludes: Accommodation, all meals, Flights, Dinners, Lunches, additional days ski rental. Self Catering Option: Price is R19 800.